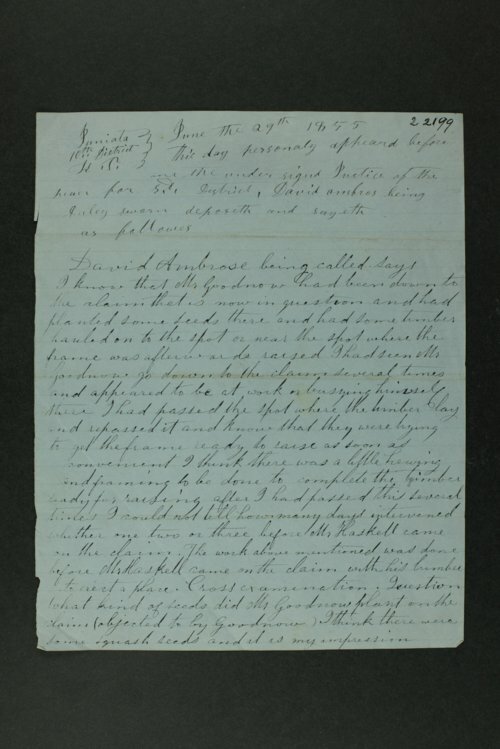 Legal documents regarding the case of William E. Goodnow vs. Isaac Haskell, including testimony given on June 29, 1855 from David Ambrose and H. A. Wilcox to Justice of the Peace S. D. Dyer in Juniata, Kansas Territory. The land claim in question was part of the townsite of Manhattan, Kansas. Ambrose states that Goodnow had planted seeds and hauled timber to a claim before Haskell. Wilcox states that Haskell told him directly he believed he had right to the claim if he built his shanty before Goodnow built a house. Testimony given by Isaac T. Goodnow, brother of William Goodnow, is also included.